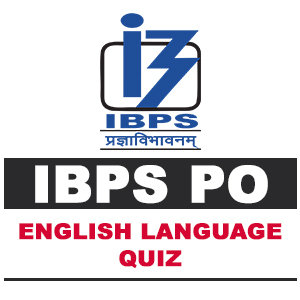 Here, we are providing you important questions of English Language for IBPS PO 2018 exam. Q.1-10. Read each sentence to find out if there is any error in it. The error, if any, will be in one part of the sentence. The number of that part is the answer. If there is no error, the answer is (5). Q.1. They were (1)/ finding to (2)/ have several internal (3)/ injuries, informed sources said (4)/. No error (5). Q.2. Its appeal coming (1)/ from humanity’s long (2)/ experience of spoken language as (3)/ the primary means of communication (4)/. No error (5). Q.3. The flexibility in gender roles (1)/ needs to being taken to (2)/ the extent where finally the concept of respective (3)/ gender roles is done away with (4)/. No error (5). Q.4. It is an open truth (1)/that working women (2)/have to facing problems (3)/ just by virtue of their being women(4)/. No error (5). Q.5. The actions taken in the next (1)/few years was set us on a path (2)/ that will be (3)/extremely difficult to redirect (4)/. No error (5). Q.6. Efforts should be (1)/made to sensitize (2)/people on the need (3)/to doing away with social biases (4)/. No error (5). Q.7. India has the world’s TB (1)/ capital recording (2)/approximately 1.9 million (3)/new cases every year (4)/. No error (5). Q.8. Would you fly (1)/ kites even though (2)/ they pose dangerous (3)/ to birds and humans? (4)/ No error (5). Q.9. Olive oil be (1)/one of the healthiest (2)/ oils available, whose (3)/ consumption is actually good for the heart (4)/. No error (5). Q.10. There are many (1)/different varieties of mint (2)/each have its (3)/own subtle flavour and aroma (4) No error (5). Q.1. (2) found should be used in place of finding as the sentence is in past tense. Q.2. (1) came should be used instead of coming. Q.3. (2) being should be replaced by be. Q.4. (3) Use face instead of facing. Q.5. (2) use will instead of was. Q.6. (4) do should be used in place of doing. Q.7. (1) has should be replaced by is. Q.8. (3) danger as a noun should be used here. Q.9. (1) is should be used instead of be. Q.10. (3) Use having in place of have.